If your child wants nothing more than a bed that will make her feel like she is living in a fairy tale or her very own playhouse, the Little Tikes Cottage Bed is a beautiful choice. 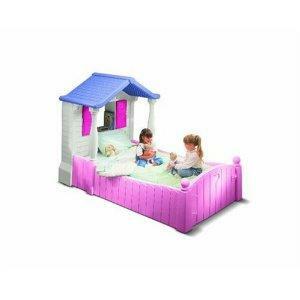 The Little Tikes Cottage Bed is more than just a bed. It comes with a headboard that looks like a cottage and holds a bookshelf behind the shutters. The cottage roof has a shingled appearance and acts as a miniature canopy over the top portion of the bed. The colors include white, dark pink, light pink, and purple, and preschoolers will love the bright color scheme. It's a great introductory bed for small children, and it's recommended for ages three and up. Before purchasing any bed, you will of course want to measure the area where you'd like to put it and compare measurements to make sure it will be a good fit. The Little Tikes bed is 97 inches long, 49 inches wide, and 60 inches high. It weighs 120 lbs. It is a twin bed that holds a box spring and mattress (not included). Some assembly is required. Kids love it. Several users purchased this bed once their children learned to climb out of their cribs and their excitement facilitates an easy transition to a "big kid bed." It holds up well to moves from house to house. Putting the mattress on the lower setting will keep your child safe in bed, not rolling off the sides. The sides of the bed are like built-in rails. The surface of the bed is easy to clean. One of the biggest problems with the bed comes from the set-up. Some reviewers reported confusing instructions, missing pieces that took a long time to get replaced and misaligned holes. It can be more of a challenge to change the sheets than on normal beds because of the placement of the pillars. The pillars can also be a problem if the child rolls around in her sleep a lot. The price is roughly $400. Be sure to check into any shipping costs before purchasing online so that you get the best deal. Choosing a brightly colored bed with an element of fun could make the transition from crib to big kid bed almost seamless, and the cottage style bed is a great alternative for those who aren't short on space or in need of bunk beds. Putting a bed that your child loves in her room could also make bedtime a breeze night after night. The Little Tikes bed is worth considering if you want something more whimsical than a traditional bed, but that will stand up to the test of time better than many smaller toddler beds that are only designed for a few years of use. The bed combines a safe sleeping environment with a playground feel, so kids and parents alike tend to love it.